Model ecosystems are an effort to recreate some of the complexity found in natural systems, and by their very nature they are more complex than single species toxicity tests. 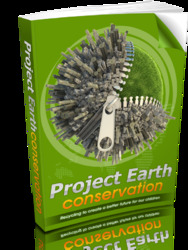 Results of experiments using model ecosystems are intended to indicate potential population and community level effects. Because they are more complex model ecosystems are also usually more expensive to build, often requiring significant area and supporting infrastructure resulting in greater associated costs and difficulty in performance over single species tests. Results from replicates of model ecosystems are often more variable than replicates of single species tests. For example, referring to the chronic assay protocol described above, in order to find a negative effect due to a toxicant, the average number of neonates produced in any concentration of toxicant must be statistically significantly less than the average number in the controls. Whether or not a difference in average neonate production is found between the control and the experimental beakers is in part dependent on the variability in neonate production or variance. Variance is by definition a function of the number of replicates in an experiment. If an investigator wants to decrease the variance associated with the average number of neonates produced and thereby increase the ability to detect differences, the number of replicates can be increased. In the single species assays, the number of replicates in the treatment is ten. 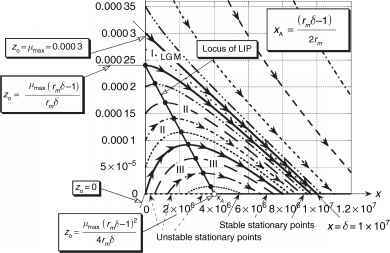 In most cases, model ecosystem replication will be limited to at most three, and in some cases there are no replicates. Increasing the number of replicates in a laboratory toxicity test is much less expensive than increasing the number of replicate model ecosystems. Cost on the other hand cannot be the overriding consideration in determining how many and what kinds of tests shown in Figure 1 should be performed in evaluating the potential effects of a chemical. When data collected from model ecosystems are analyzed, it is still common to break down the massive amount of data collected into distinct groups of organisms. The structure of aquatic insect communities or algal communities might be compared between the controls and the various treatment levels as might the numbers of each of the groups as well as overall species richness (the number of different species present) and evenness (the distribution of individuals among the species present). While this can provide valuable information, these analyses alone do not take full advantage of the community data collected. The development and application of multivariate statistical methods analyzes all the available data from the study and provide managers, regulators, and ecotoxicologists with powerful tools to visualize and present impacts at the community and ecosystem level. The factors that increase the 'realism' of microcosm tests over single species tests are that there are multiple species in a microcosm. Because there are multiple species, structural as well as functional endpoints can be evaluated. However, the structure of a microcosm is not such that the system can support all trophic levels found in larger 'cosms'. On the other hand, microcosms can be replicated more easily than larger mesocosm and natural systems. By one definition outdoor microcosms are experimental tanks/ponds that contain less than 15 m3 water volume. Figure 9 shows a series of microcosms and mesocosms at the University of North Texas used to study the effects of pesticides on community structure and function. 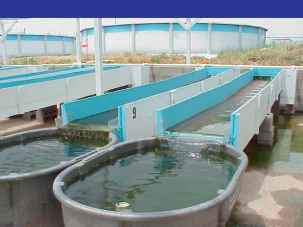 Mesocosms, as the name suggests, are larger than microcosms. By one definition model outdoor experimental tanks/ponds greater than 15 m3 water volume are considered mesocosms. Figure 9 shows a series ofpond mesocosms at the University of North Texas Field Station. Mesocosms generally have a better developed community structure than microcosms but usually are still not large enough to maintain some top level predators and do not have all the complexities of natural systems such as larger ponds, lakes, or streams. The endpoints measured in mesocosms include changes in structure and function of the developed communities and through the use of multivariate techniques all the data collected in a study. In some cases organisms in cages have been added to mesocosms to measure the direct effects of the tested chemical on a particular caged species. 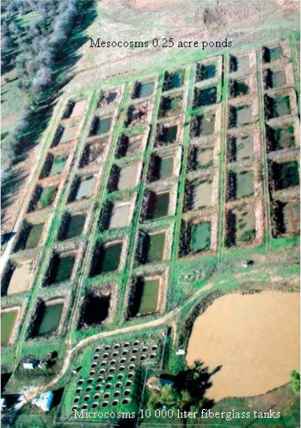 Figure 9 Aerial photograph of the 52, 10 0001 fiberglass microcosms and 46, 0.1 ha mesocosms located at the University of North Texas Water Research Field Station. In addition, there are 24 smaller 10001 microcosms not shown in the photograph. Photograph courtesy of Dr. James H. Kennedy, Director of the Field Station. Microcosm facility at the University of North Texas Aquatic Research Facility. greater are considered mesocosms. Artificial streams are generally constructed in a manner that allows them to be fed through a headbox by natural stream or river water. Figure 10 Experimental streams facility at the University of North Texas. Each stream is fed from a common headbox. Each stream has a run of shallow water and riffles followed by a terminal still water tank. Photograph courtesy of Dr. Tom La Point, Director of the Institute of Applied Sciences, University of North Texas. some cases organisms in cages have been added and direct effects on those organism can also be determined.